Size: 4 1/8" x 7 3/8"
Company: MCA Home Video, Inc. 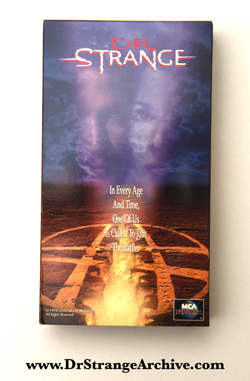 Description: This is the 1995 VHS release of the 1978 Dr. Strange TV pilot. It has a run time of 1hr 34min. This is the version released for purchase. The rental store version from 1987 is also in the Archive. The number 55104 is printed on the side.